KDE Games – Does anybody play them? A couple of weeks ago I reviewed openSUSE 13.1. In that review I listed all the applications which came pre-installed with the KDE live DVD. I mentioned at the time that simply listing the applications doesn’t particularly help, especially if you don’t know what those applications are and what they do. I have been using openSUSE non-stop over the past 2 weeks and I have been trying out the applications. In this article I will be looking at the games that come pre-installed with the KDE desktop within openSUSE. When I was younger (a lot younger, maybe 10, 11 or 12) my parents used to take me on a summer holiday. Invariably the holiday would be to the Isle of Wight, which is a small island to the south of Portsmouth in England, or to Devon in the south west of England. One year we went to a place called Teignmouth in Devon and we stayed in a small hotel (can’t remember its name) but lets just say that Teignmouth isn’t far away from Torquay and Torquay was the setting for the BBC comedy series Fawlty Towers. The owner of the hotel in Teignmouth clearly used videos of Fawlty Towers as a training video. The first year we went to the hotel it was fine. We were treated well and we had a great holiday. The hotel owners were very hospitable and they even had one of those long play records that had horse races on it. You could check the betting guide and make small bets and then the owner would play the record and the pot was split between the winners. The second year was completely different. The rooms were horrible, the food had gone completely bonkers. No porridge for breakfast only Special K and one night we were told the pudding would be “Pear surprise”. When we asked what “Pear surprise” was the reply came “It is peaches”. (That reminded me of the episode of Fawlty Towers where Cybill said “Well it is a bit tricky, it does mean chef will have to open another tin”. The hotel that year also had a number of German guests. (which is of course one of the classic Fawlty Towers episodes). Why am I telling you all this you may ask and why are we not talking about games? The point is coming I promise. There was no entertainment in the hotel and the weather was terrible. There is absolutely nothing to do in Teignmouth when it is raining. Nothing except for playing board games. Jenga, Chess, Draughts, Risk, they were all there. I spent a whole week learning how to play each game and I had a good time. I remember playing a couple of the German lads at Risk and lets just say they re-wrote history on more than one occasion. The truth is that I haven’t played any of these games in a long long time with the exception of Risk. The same can be said of the games within openSUSE. 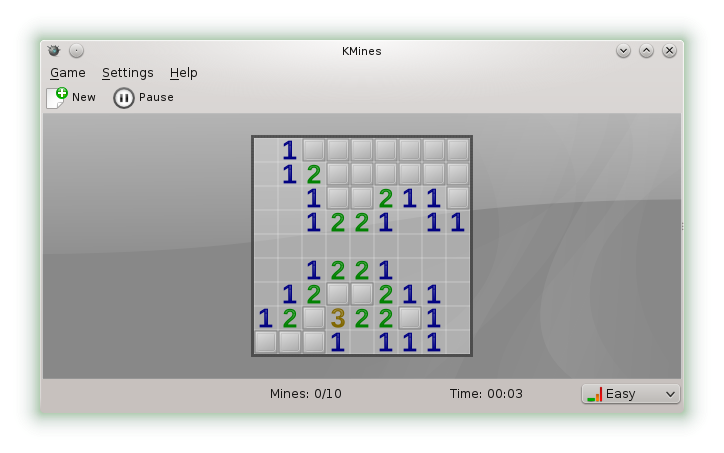 KMines is a copy of the game minesweeper that I first played in Windows 3.1. I remember when I was at IBM I had a competition with another guy in the IT department to see who could complete each level of minesweeper in the quickest time. I managed 7 seconds for the small one. As for Solitaire I remember playing it when I got my first desktop computer but I have never really played it since. I never turn on my computer and think “oh, I must have a game of Reversi”. There is just too much other stuff available to even consider playing that game. It isn’t that Reversi is a bad game it just doesn’t feel relevant anymore. Do you ever play the games that come pre-installed with a desktop environment or distribution? Would you miss them if they weren’t there? Mahjongg is a bit like the card game pairs. If you have young children I am sure you have played a card game where you flip a pack of cards over and each of you takes it in turn to flip 2 cards over. If the 2 cards match then you put them to one side and have another go. The winner is the person with the most pairs. Mahjongg is a similar game but for one person. The cards are laid out similarly to the image above. The cards are spread out across the board and stacked. The idea is to match the pairs. There are certain rules however. You can only pick cards at the edge or on top of stacks. You can’t leave cards orphaned so that they are on their own. You win the game when there are no cards left but lose if there are no more moves available. The game itself is well written and there are lots of settings. For instance, you can change the layout of the cards, the tiles that are used and the background. KReversi is an incredibly simple game. It is actually the sort of game you can play with your kids if you are travelling on a train. All you really need is a piece of paper and a pen. Again the computer game version is well polished and works very well. The rules of the game are simple yet the game takes tactical skill in order to win. The game starts with 2 black and 2 white markers in the centre of the grid laid out black, white, white black. The player always gets to go first and is in control of the black markers. To make a move the player has to place a black marker in a place to make a line. For instance the horizontal line might be black, white. The player would place the marker at the end to make it black, white, black. This would then turn the whole line black. The computer then makes its move and places a white marker on the board to form a line and this would turn all markers in that line white. The player with the most markers on the board when the board is full wins the game. Believe me, it isn’t as easy as it sounds. 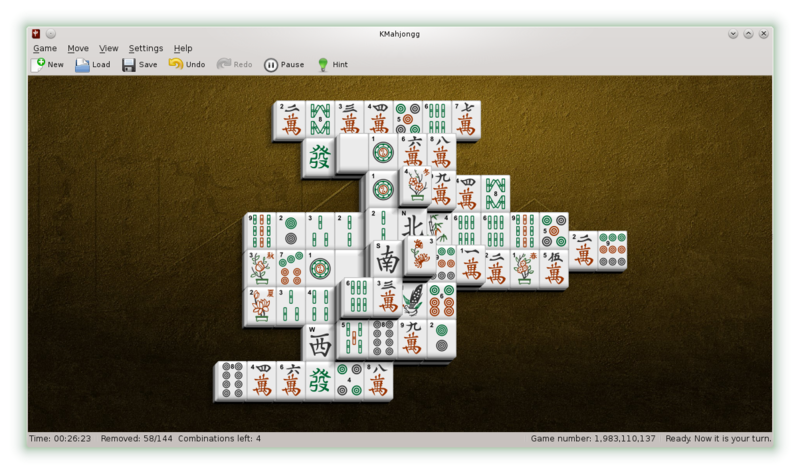 The game itself hasn’t got as many customisable features as KMahjongg but you can change the markers to be different colours and you can define the difficulty setting. 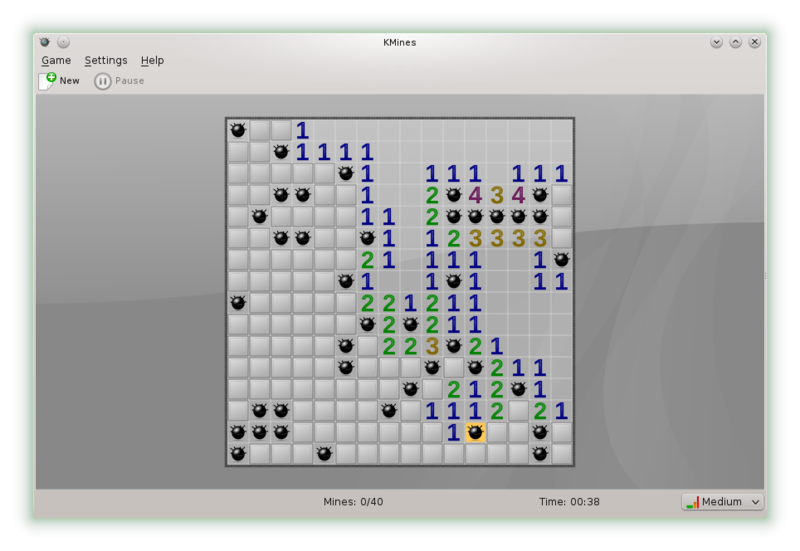 I used to really like Minesweeper and playing this the other day was actually a blast from the past. I am a very competitive person and I wasted far more time playing this than I had initially wanted to. The board starts out as a grid of squares. Clicking on one of the squares opens the grid up with numbers defining how many mines there are in the vicinity. Based on the numbers given you can eliminate the squares that don’t have mines by clicking on them. If you manage to clear all the good squares then you win the game. If you hit a mine then you lose. There are three difficulty levels and a custom setting. Difficulty is defined by the size of the board. There are various other settings available including different themes including a graveyard theme. Sudoku has become a gaming phenomenon and now regularly appears in the puzzles column of most newspapers alongside the classic crossword. The idea is to place each of the 9 numbers in each little square so that they appear only once. You also need to make sure that each row only contains the numbers 1 to 9 so that they appear once and the same for each column. I have to admit to doing the Sudoku on the train every night. There are 3 puzzles in the local paper with different skill levels, easy, medium and challenging. 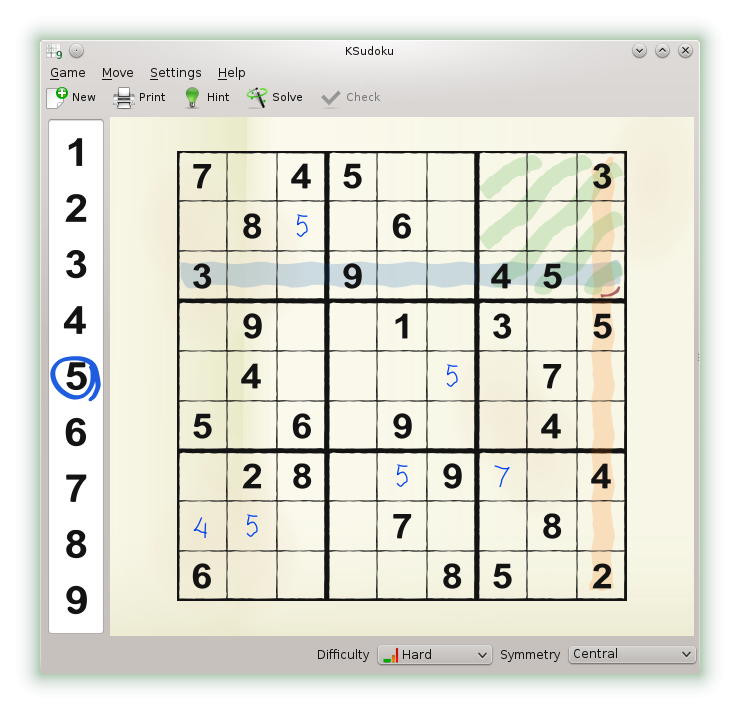 The KSudoku version has 6 levels, very easy, easy, medium, hard, diabolical and unlimited. The diabolical and unlimited levels are fairly pointless as there is a lot of guesswork. 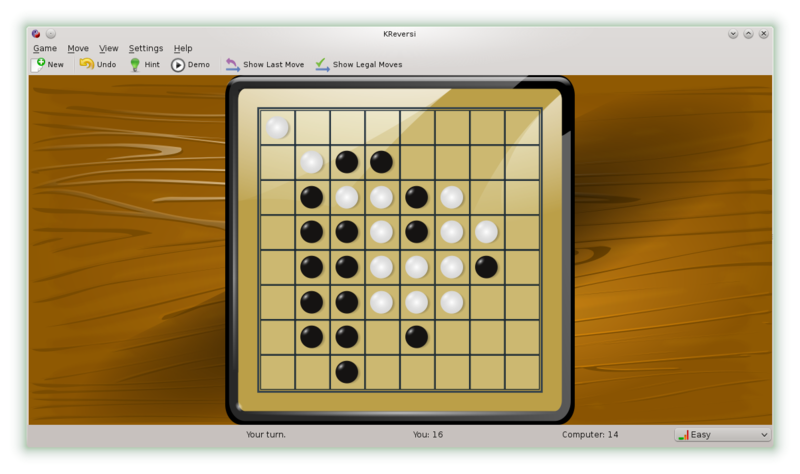 The KSudoku version also lets you play with the dynamics of the game. For example you can make it a 4 x 4 grid (good for kids) or you can do a 3 dimensional puzzle (a cube). Personally I am a traditionalist and prefer the original game. I was slightly disappointed with the controls for KSudoku. You pick the number on the left and click into the cell in the grid. I would prefer just to be able to use the keyboard. It is also possible to change the style of the grid and various other cosmetic settings to make it the way you want it. Patience is a series of card games that you play whilst you are on your own. The KPatience game is actually very good. There are lots of different games but I must admit that some I didn’t get even after reading the rules. Aces Up for instance seemed to be a case of randomly clicking cards. The game that most people will recognise is Klondike. The idea in Klondike is to build up 4 sets of cards in suit order. So pile 1 would be Ace of Hearts, 2 of hearts and onwards until the King of Hearts. Pile 2 would be clubs, then diamonds and then spades. To fill up the piles you have to move cards around by mixing suits so that the cards are in descending number order, for instance 10 clubs, 9 diamonds, 8 spades, 7 hearts etc. When an ace is revealed it will be moved into position automatically. You can then begin to add each card in turn. If you run out of moves you can click on the pack in the top left corner to reveal more cards. There are a number of difficulty settings and you can determine whether to only play winnable games. 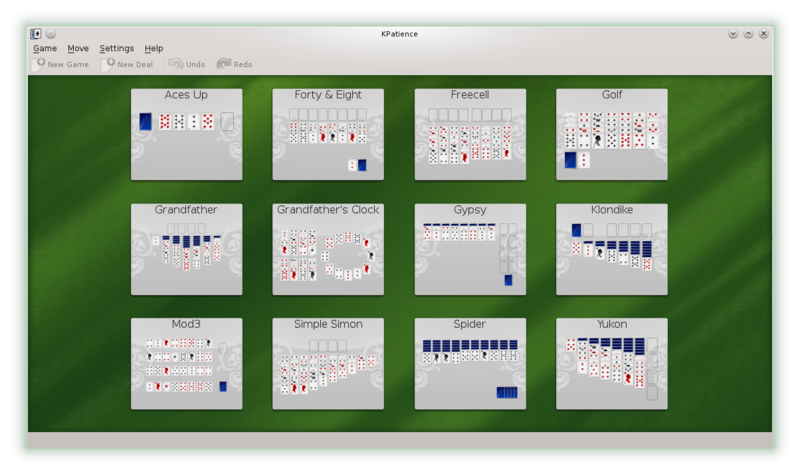 The whole KPatience game has loads of different games, settings and themes. The games are definitely well written and are arguably better than the Windows equivalents. The question has to be asked though whether they are still relevant. Do you play these games? Are they still popular? Do you fancy a challenge?. Why not play KMines and post a link here to an image showing your fastest time. You are right. I was a little surprised by the reaction on Reddit because they say the same as you. I didn't realise these sort of games were so popular. I am addicted to Kpat. Best solitaire game out there. Kpat, KSudoku – must have them. I don't play kreversi, the others I play all the time. KMahjongg, Kapman, Kpatience, Kolor Lines, KDiamond, are all fun games that I play on a semi-regular basis. I play KMahjongg almost on a daily basis… sometimes for more than an hour at a time. Of course I've been play Mahjongg games since the mid-80s… my first love in the genre was Activision's Shanghai(sp?) for the Atari ST back in 1986 or so. The only feature that it had that I miss in KMahjongg was a competitive multi-player mode that involved passing the mouse around. Always like Mahjongg and just new to trying Revesi. But mainly into Chess now on my 7" tablet and installed Dream Chess on my SolydK KDE setup. As trying to stimulate the last dozen or so neurons I have left in this old over half-a-century cranium. And my tablet and ebooks have got me back into reading more also which is a plus. When I used Kubuntu, the first thing I did after installing the distro was intall kmines, kpatience and kmahjongg, so I could play while downloading updates and installing other software. I use Slackware now, which comes with the full kdegames by default. Other fun games from kdegmaes are knetwalk, killbots and knavalbattle. Well, I play mahjongg, shisen-sho and some simple solitaire, but not usually the K versions. Nothing against them, just didn't end up standardizing on those ones. I like to listen to music while I play the games; the focus I need for the games is superficial enough that they don't really distract me from each other; I feel like a nice fast rhythm on a song may even speed up my play. Yes i play them (except ksudoku), specially mahjong, i love them. I actually play Kpatience these days. 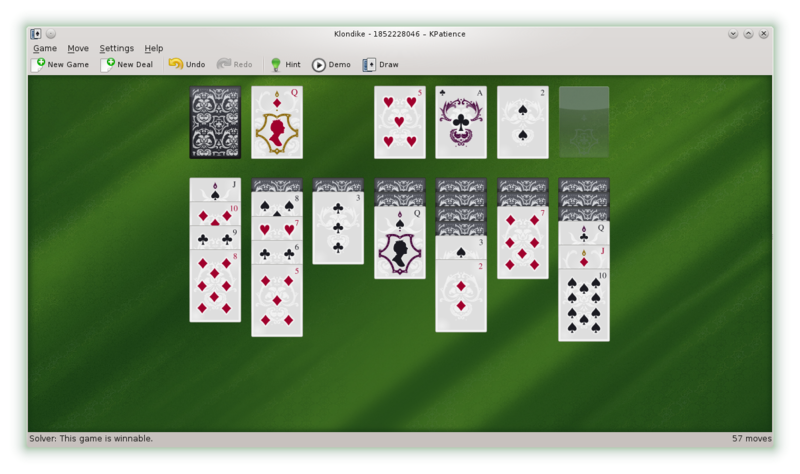 The Yukon variant reminds me of the old Solitaire in Windows. As a gamer, I'm really a FPS guy… don't care much about other genres. But I really enjoyed playing against humans long, long ago (mostly Quake). When games evolved, i got less time and as situations became more realistic, I found it uninteresting to kill characters who looked — and died — like real people. I went back to Nexuiz for a time and then stopped playing a couple of years ago. Small games became then sort of a break from work. Kpatience evokes situations which I find inspiring given the way I think and work; I find it a great way exactly to acquire patience. I liked Shisen-Sho a lot, not so much Kmahjongg — the 3D aspect is somewhat confusing. Despite the simplicity of said games, some people really are into them. It's amazing to see someone pick these games though richer ones may be available. I guess not everyone has the time to learn lots and lots of new rules. Other good options of light pastimes are bejeweled look-alikes (e.g. kdiamond), jigsaw puzzles (forgot the name… Palapeli) and word puzzles like the excellent Connectagram (unfortunately English-only). These are not installed by default but enjoyable nonetheless. I use linux @work and ksudoku, kpat, knetwalk and kmahjong relieve the drudgery. I have played KMahjong a few times along with KSudoku and KReversi. I used to play them more before I found Frozen Bubble. Frozen Bubble is not my most often played time waster. Meant to say Frozen bubble is NOW my most often played time waster. I play several of them, but I never developed a sukoku habit on paper or computer, so not that one. I'd like to see Nine Men's Morris as a game. Can only speak for myself but I play them all the time. I don't have 4 hours to play an RPG but I can spend 10 minutes playing solitaire. I gotta have my KDE games! I play them, my wife plays them, my grand kids play them. Life would be total chaos without KDE games! Jenga, Chess, Draughts, Risk, they were all there. I spent a whole week learning how to play each game and I had a good time. I remember playing a couple of the German lads at Risk and lets just say they re-wrote history on more than one occasion.Thanks for sharing. KMahjongg almost daily. Also LBreakout2 which I add from repository. That's pretty much it.